After winning a talent contest sponsored by the Pye record company Emile and his group were given a chance to record. His group, the Checkmates, consisted of his two step-brothers George and Dave, Ken Street, Pete Carter, Les Hart, Alan Hawkshaw, and John Cuffley. They made a version of 'What Do You Want To Make Those Eyes At Me For' which was originally destined to be a 'B' side. Fortunately, Pye were shrewd enough to issue this as the 'A' side and the disc took Emile all the way to a UK #1. 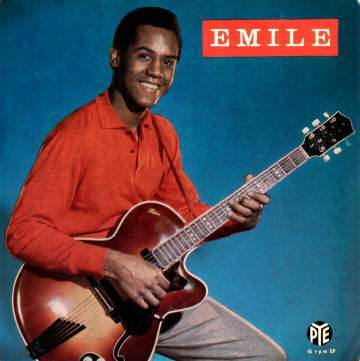 Emile had three EPs released during his 1960s recording career and the one shown here (NEP24119) is the first of them. With the exception of "Red Sails In The Sunset" it contains tracks not found on his singles, so it's a nice way of getting hold of more Emile Ford material on 45rpm. One of the included songs, "Move Along", was written by Emile himself. The sleeve pictures Emile with a guitar, which is mentioned in the record's sleeve notes. It is claimed that he learned to play the instrument in only one week, despite his only previous experience being the piano which he played by ear. Emile Ford managed to squeeze a few more hits from his patented sound system before having to return to engineering. He faded from the scene somewhat during the latter part of the sixties because he made his home in Scandinavia. However he continued to market his sound system in the UK and used it in the production of other artists with which he became involved. Emile moved to California during the 1990s, but still undertakes stage work from time to time as well as selling his own unique sound equipment whenever the opportunity arises. NEP24124 1960 "Emile Ford Hit Parade"
NEP24133 1960 "Emile Ford Hit Parade Vol.2"